First clinical sign of Papilledema on fundoscopy? 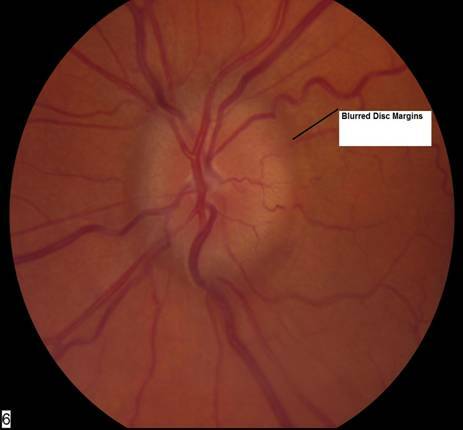 The term papilledema has come to mean disc swelling due to raised intracranial pressure although there are other causes of a similar funduscopic appearance. It must be made clear, however, that an ophthalmoscopic appearance identical to that of papilledema can be produced by infarction of the optic nerve head (the “papillopathy” of anterior ischemic optic neuropathy) and by inflammatory changes in the intraorbital portion of the optic nerve (“papillitis”, a form of optic neuritis). In its mildest form, papilledema appears as slight elevation of the disc and blurring of the disc margins, especially of the superior and inferior aspects, and a mild fullness of the veins in the disc.